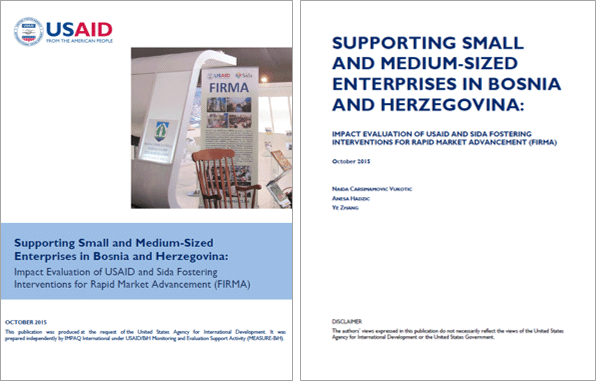 Impact evaluation of Fostering Interventions for Rapid Market Advancements (FIRMA) was the second impact evaluation conducted by MEASURE-BiH for USAID/BiH. FIRMA was a $21 million activity financed jointly by United States Agency for International Development (USAID) and Swedish International Development Cooperation Agency (Sida) to support small and medium-sized enterprises (SMEs) in the sectors of wood processing, tourism, and light manufacturing/metal processing in Bosnia and Herzegovina (BiH). FIRMA’s objective was to increase sustainable economic growth as measured by increased sales, exports, sustainable employment, and access to finance. FIRMA implementation spanned from September 2009 to May 2015. Providing USAID/BiH staff with empirical evidence and information that could inform future funding decisions and program designs. What impacts did FIRMA activity have on participating SME’s outcomes (sales, exports, employment, and access to finance)? To what extent did the impacts vary across sectors? How was FIRMA activity implemented? What challenges did FIRMA activity face in implementation and how could those challenges be overcome? What are the lessons learned and recommendations from beneficiaries’ perspective for future donor or government interventions in targeted sectors? The impact evaluation of FIRMA was based on a quasi-experimental design in which the causal effects of interventions were identified and estimated by comparing outcome differences before and after the FIRMA interventions between the beneficiaries and a comparison group of SMEs that were not involved in the FIRMA interventions. Detailed information on SME characteristics in the BiH administrative data allowed us to reduce the risk of selection bias in the multivariate regression version of the difference-in-differences model we implemented for the FIRMA impact evaluation. An important complement to the impact analysis, our in-depth qualitative implementation study provided USAID/BiH with the understanding of how and why the FIRMA interventions changed outcomes. It provided important documentation of how the activity was implemented for subsequent program design.